Without a doubt, the most important and emblematic animal of China is the panda. This cute and, not very common, the mammal is the protagonist of the Panda King slot, which the developers of Ainsworth Gaming have released to play for free and with HTML5 technology. Of course, one of the most prominent icons in the Panda King slot game is a wild panda. In addition, the characteristic symbol Yin-Yang appears, belonging to the Chinese culture, which is a scatter icon or Scatter. The symbol of Panda King is the Wild icon and has the distinction of being able to replace all the other icons on the drums, with the exception of Scatter. That is, the Yin Yang symbol is the only one that cannot be replaced. Bringing the most significant of Eastern civilization, the game shows a legendary Chinese coin, a pergola with the purest Asian style, a lotus flower and an exquisite and gleaming gold ingot. Also, following the mystery that holds all the wisdom of the East, appears an icon that presents wonderful features, providing many special benefits, characterized by a scroll that shows a letter that translates as “fortune.” One of the properties of this icon is that it can only appear during the execution of the free spins and has the characteristic that it can only occupy only one place and it is not possible to move it to another site. Also, poker cards that offer a lot of value to the player are part of this game. In this form, the cards identified with the numbers 9, 10 and the letters J, Q, K and A are shown in any place on the drums. The Panda King online slot is developed by pressing different buttons, strategically located on the machine’s screen. A fairly large, white button is shown, designed with an arrow, which triggers a spin on the reels. The key marked with “+”, gives access to the auto spin, through a window. In these turns, the player can set the number of laps and the amount of profit and loss, stopping, automatically, when you reach this limit. The button similar to a key allows establishing the bet between 0.01 and 100, the lines of payment from 1 to 20. The key with the letter l gives access to the table of gains and rules of the game. The amount of the payment will be reflected in the table permanently. This slot machine has the traditional 3 rows, 5 drums and only 20 lines with 9900 coins. But the game gets very exciting when they appear the fabulous Free Spins, which can be obtained by activating more than 3 Yin Yang icons that are the Scatter icon, somewhere on the drums, when you are making a turn. When the Scatter symbol is activated, the player will obtain the amount of what is being multiplied by 3. Also, he obtains another advantage, which is represented by a number of free spins, totally different. During each free spin Panda Bear and Yin Yang are shown in columns 2 through 4. The free spins can be of three types, with options that are 8, 10 or 12 turns, in which the wild panda will be replacing other icons, completely different in several drums of each of the turns. When the player selects the 8 free spins, it will be possible to play only with the Wild icons. These icons will be represented by the waterfall, the fabulous Chinese coin, the east pergola, the cherry blossom and the lotus. But you choose to play the 10 free spins, there will be a surprising change because the icons identified with the typical oriental pergola, the bright Chinese coin, the lotus and the waterfall are modified and become Wild. Finally, during the round of 12 free spins, there is a possibility that the icons of the pergola, coin and cascade will become Wild symbols, only if they are achieved in the second, third and fourth reels. In addition, the Panda King slot offers the opportunity to re-activate the free spins, by matching 3 or more Scatters during the development of the bonus games. Having the possibility of getting extraordinary payments to pick up the icon of the letter that means “fortune”, while the free spins are played. In this free version of Panda King, the attractive progressive jackpot is not available. Instead, the player is offered a maximum win for the amount of 200,000 credits, when 5 Yin Yang icons are collected, during the initial game. The maximum amount of bets is 100 coins. One of the biggest advantages of Panda King is that while adapting the amount of the bet, the player can learn about the value of each of the icons and, thus, be able to bet on the amount you decide. But this option must be done outside the game. This means that the player must leave the action, adapt the amount of the bet and then return to the game. This table of values, sometimes, is not very useful, but it is a requirement of the game. Another modality of the game that offers free spins is achieved when 3, 4 or 5 icons are represented by the Yin Yang and drums 2, 3 and 4 are located. At this moment, the game will provide the amount of 5, 8 and 10 free spins, respectively. Likewise, there are other possibilities for obtaining excellent profits, such as when you get a total of 5 icons, corresponding to the lotus flower and that is in a single line of payment. When this move is achieved you can earn a reward of up to 2,500 coins. In this slot, the graphics are shown very clearly and with well-defined colors. It has a very funny animation, which keeps the player’s interest awake since, at the least expected moment, the main character appears and offers a friendly greeting. These continuous appearances from the back of the button that is used to turn to make the player stay alert to any changes in the game. The drums are inserted in a bamboo form, in the middle of one of the most impressive forests in China, each of the symbols that this slot game, have a close relationship with the life of Asians, from the most impressive waterfalls, flora, and fauna, to typical buildings. The sound is very original and transports the player to the most remote places of ancestral China, the music is quite relaxing, with melodious harmonies that provide a space of tranquility and concentration. In general, the audio is inspiring. 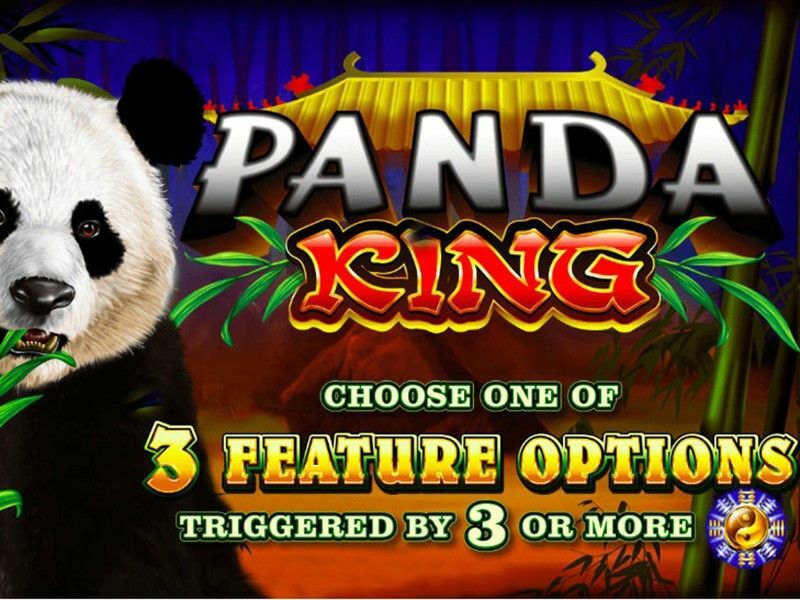 Panda King can be found in most land-based casinos worldwide, but it also has a version for mobile phones with Android technology, for computers. The machine is available in countries like Australia, New Zealand, and the United Kingdom, causing a great sensation to fans of everything that has to do with the rich and ancient Asian culture. The funny touch, the sympathetic bear, as it is dedicated to making its appearance unexpectedly, above the key that says “Rotate” or when you press this key. Offering warm greetings and wrapped in the typical bamboo canes, the preferred food. This new version presented by the company Ainsworth can be played easily and does not have to download or register on any website. So, now you can play Panda King for free and without restrictions. Of course, one of the most prominent icons in the Panda King slot game is a wild panda. In addition, the characteristic symbol Yin-Yang appears, belonging to the Chinese culture, which is a scatter icon or Scatter. The symbol of Panda King is the Wild icon and has the distinction of being able to replace all the other icons on the drums, with the exception of Scatter. That is, the Yin Yang symbol is the only one that cannot be replaced. Bringing the most significant of Eastern civilization, the game shows a legendary Chinese coin, a pergola with the purest Asian style, a lotus flower and an exquisite and gleaming gold ingot. Also, following the mystery that holds all the wisdom of the East, appears an icon that presents wonderful features, providing many special benefits, characterized by a scroll that shows a letter that translates as “fortune.” One of the properties of this icon is that it can only appear during the execution of the free spins and has the characteristic that it can only occupy only one place and it is not possible to move it to another site. Also, poker cards that offer a lot of value to the player are part of this game. In this form, the cards identified with the numbers 9, 10 and the letters J, Q, K and A are shown in any place on the drums. This slot machine has the traditional 3 rows, 5 drums and only 20 lines with 9900 coins. But the game gets very exciting when they appear the fabulous Free Spins, which can be obtained by activating more than 3 Yin Yang icons that are the Scatter icon, somewhere on the drums, when you are making a turn. When the Scatter symbol is activated, the player will obtain the amount of what is being multiplied by 3. Also, he obtains another advantage, which is represented by a number of free spins, totally different. During each free spin Panda Bear and Yin Yang are shown in columns 2 through 4. The free spins can be of three types, with options that are 8, 10 or 12 turns, in which the wild panda will be replacing other icons, completely different in several drums of each of the turns. When the player selects the 8 free spins, it will be possible to play only with the Wild icons. These icons will be represented by the waterfall, the fabulous Chinese coin, the east pergola, the cherry blossom and the lotus. But you choose to play the 10 free spins, there will be a surprising change because the icons identified with the typical oriental pergola, the bright Chinese coin, the lotus and the waterfall are modified and become Wild. Finally, during the round of 12 free spins, there is a possibility that the icons of the pergola, coin and cascade will become Wild symbols, only if they are achieved in the second, third and fourth reels. In addition, the Panda King slot offers the opportunity to re-activate the free spins, by matching 3 or more Scatters during the development of the bonus games. Having the possibility of getting extraordinary payments to pick up the icon of the letter that means “fortune”, while the free spins are played. In this free version of Panda King, the attractive progressive jackpot is not available. Instead, the player is offered a maximum win for the amount of 200,000 credits, when 5 Yin Yang icons are collected, during the initial game. The maximum amount of bets is 100 coins. One of the biggest advantages of Panda King is that while adapting the amount of the bet, the player can learn about the value of each of the icons and, thus, be able to bet on the amount you decide. But this option must be done outside the game. This means that the player must leave the action, adapt the amount of the bet and then return to the game. This table of values, sometimes, is not very useful, but it is a requirement of the game. Another modality of the game that offers free spins is achieved when 3, 4 or 5 icons are represented by the Yin Yang and drums 2, 3 and 4 are located. At this moment, the game will provide the amount of 5, 8 and 10 free spins, respectively. Likewise, there are other possibilities for obtaining excellent profits, such as when you get a total of 5 icons, corresponding to the lotus flower and that is in a single line of payment. When this move is achieved you can earn a reward of up to 2,500 coins.